This is the major reason people like to live on their own. You are probably saying, in this recession? Trust me I understand that, after all I am back in my mother’s house but the truth is if I had a good job and a steady income, I would do it again. You know, family can be a distraction (sometimes in a good way and other times, not so much)? Especially for the creative minds, being around family can really delay your achievements, especially someone like me that cares about every single thing, how can I do that and still find time to write? With writers block and all of that… But living alone helps you concentrate, plan your time well and be more focused. When I was living alone, I don’t look for my things, they are always were I left them, if I like I cook ,if I like I eat out and use that cooking time for something else. If I have to read a book, I read a book. It was even that period I was able to read Fifty Shades of Grey, before then I could not remember the last time I read a book. So do you see what I mean? You plan your time better, you keep yourself busy but in a good way. Can’t even begin to explain how well you get things done while living alone. Getting your own apartment comes with a lot of responsibility which is not a bad thing… It prepares you for the future. As a man, leaving your parents’ house to go make your own money shows a sign of maturity and responsibility, by doing so you are also planning for your future family, learning new things and how to take care of yourself – cause it’s only when you can take care of yourself you can take care of others. When I got my new apartment, though I’m not good with electric stuff and had no idea you need a power box to connect to your electric pole and not directly. Because I’m a lady the first electrician scammed me and did not get a power box, connecting it directly so I had to call another person. If I hadn’t lived alone, I wouldn’t have known that. I was able to get a painter after buying my paint and carpenter. Afterwards, I started paying monthly electricity bills, security and trash bills. I also did some DIY like fixing the door, unclogging my sink and fixing the flusher cause let’s face it, handymen these days are just after money, so it’s good you do some things yourself. This made me really appreciate my childhood and what my parents and elder sister did for me but it was also helping me for my future – I don’t have to wait for my future husband to get back for things to move in the house. Though I have always been independent and industrious, I learnt a lot from this experience. As a lady, we are under so much pressure to be perfect that we can’t even breathe living with family. Especially if you are a certain age and you are not married, pressure from parents, even from your siblings sometimes (they might not say it directly but they do). You can’t even stay up late with friends or pursue your dreams because they are things “women should not do”. If you don’t prepare food for them cause you were busy with something else, they’ll make you feel less of a woman… but having your own apartment gives you freedom to go out and stay as late as you want, sleep as long as you want or just do the things you like to do as much as you want. Apart from paying bills bills bills which should not be a problem if you have a good job, you don’t just spend unnecessarily. Since you buy your food items and it’s just you, you have an idea of when it will finish and you can do without eating if you wish. You can give account of how you spent your money and plan yourself till the next salary comes. But living with family, especially when you have too many of them that destroy things a lot that needs to be fixed, sometimes if there is no food, you buy some food items and because of their number you buy more than necessary. . Spending more makes you have no savings, after working for so many years (though salaries for graduates is nothing to write home about) and no decent money in your account. At the end of the day, you start to wonder how you spent all that money and how you have not saved. 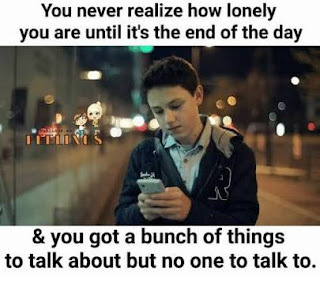 No one likes to be lonely, at least not all the time. Though my sister (that people say we look like twins) can be very annoying most times but she is still my sister and my brothers can be very troublesome but they are still family and it’s good to have them around sometimes. Being in my apartment without a job made me almost lose my mind; no one to cheer me up, I was always in my room, sometimes I’m happy (or try to be happy),sometimes I’m sad and I think about doing some really evil things to myself . It wasn’t a good experience; I even hooked up with my neighbor (and I never do that) cause I was bored. I just wasn’t myself. Yeah, maybe if I was working it wouldn’t have been that bad ;just go to work during the week and rest on weekends…the circle continues but I wasn’t so it was awful living alone. As a lady and a pretty one, living alone is just an opportunity for men to flock at your door. I didn’t allow that because it’s not who I am and it wasn’t my reason for having my own apartment. Most times each time a guy ask me to invite him, I would lie that I’m living with my sis or that I wasn’t living alone. I started regretting why I told them I was getting an apartment in the first place but since I did, I looked for excuses so they couldn’t visit. For some ladies, men coming around might not be a disadvantage of living alone but for me it was. I love my privacy and that also involves the absence of men, my apartment was kind of like my cave, my sanctuary – where I can just be myself and relax. So having men around would be a distraction. Therefore, I advise you to get your own apartment so you can experience what I experienced – the good, the bad, the ugly…but trust me, it is quite rewarding especially if you are looking to start your life and plan a future. So over to you guys – have you lived alone, currently living alone or plan to live alone? What is your experience or thoughts on this so far? Are you happy you got an apartment or think you should get your own apartment?